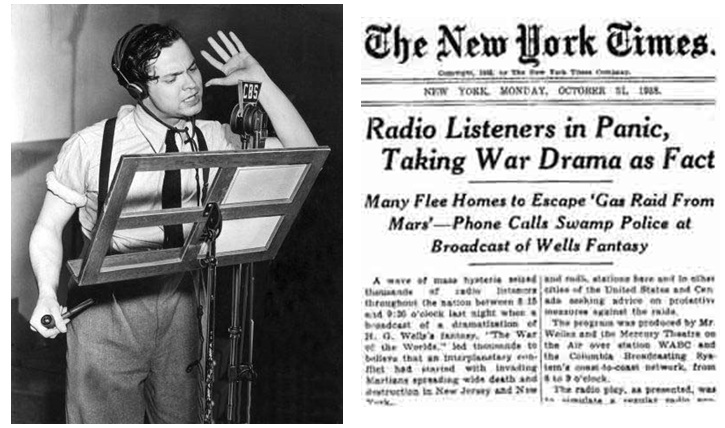 Orson Welles causes a nationwide panic with his broadcast of “War of the Worlds”—a realistic radio dramatization of a Martian invasion of Earth. Orson Welles was only 23 years old when his Mercury Theater company decided to update H.G. Wells’ 19th-century science fiction novel War of the Worlds for national radio. Despite his age, Welles had been in radio for several years, most notably as the voice of “The Shadow” in the hit mystery program of the same name. “War of the Worlds” was not planned as a radio hoax, and Welles had little idea of the havoc it would cause. Sunday evening in 1938 was prime-time in the golden age of radio, and millions of Americans had their radios turned on. But most of these Americans were listening to ventriloquist Edgar Bergen and his dummy “Charlie McCarthy” on NBC and only turned to CBS at 8:12 p.m. after the comedy sketch ended and a little-known singer went on. By then, the story of the Martian invasion was well underway. Welles introduced his radio play with a spoken introduction, followed by an announcer reading a weather report. Then, seemingly abandoning the storyline, the announcer took listeners to “the Meridian Room in the Hotel Park Plaza in downtown New York, where you will be entertained by the music of Ramon Raquello and his orchestra.” Putrid dance music played for some time, and then the scare began. An announcer broke in to report that “Professor Farrell of the Mount Jenning Observatory” had detected explosions on the planet Mars. Then the dance music came back on, followed by another interruption in which listeners were informed that a large meteor had crashed into a farmer’s field in Grovers Mills, New Jersey. The Martians mounted walking war machines and fired “heat-ray” weapons at the puny humans gathered around the crash site. They annihilated a force of 7,000 National Guardsman, and after being attacked by artillery and bombers the Martians released a poisonous gas into the air. Soon “Martian cylinders” landed in Chicago and St. Louis. The radio play was extremely realistic, with Welles employing sophisticated sound effects and his actors doing an excellent job portraying terrified announcers and other characters. An announcer reported that widespread panic had broken out in the vicinity of the landing sites, with thousands desperately trying to flee. In fact, that was not far from the truth. The Federal Communications Commission investigated the program but found no law was broken. Networks did agree to be more cautious in their programming in the future. Orson Welles feared that the controversy generated by “War of the Worlds” would ruin his career. In fact, the publicity helped land him a contract with a Hollywood studio, and in 1941 he directed, wrote, produced, and starred in Citizen Kane—a movie that many have called the greatest American film ever made.